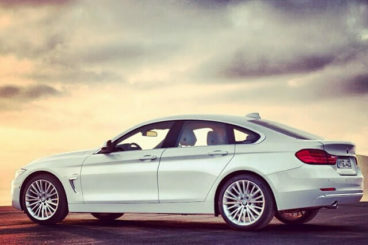 Looking for an objective review of the BMW 4 Series Gran Coupe? OSV have got you covered, from engines to lease deals. 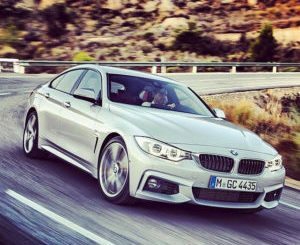 The brand new BMW 4 Series Gran Coupe is in great company, and adds even more power and practicality to the 4 Series’ already impressive arsenal that includes the convertible and the regular coupe. Technically, the 4 Series has replaced the outgoing 3 Series. But BMW, purely for marketing reasons, prefer us to think that that this Gran Coupe and its stablemates are shiny new things. Just for them, we’ll pretend they are. And it’s easy to believe this, too – the Gran Coupe looks fresh, and is a fab five-seater rival to the Audi A5 Sportback that’s threatening to dominate this sector. OSV takes a closer look at what it’s all about with our 2017 BMW 4 Series Gran Coupe review. Unusually for a BMW, this Gran Coupe isn’t especially exciting to drive. It’s more comfortable than anything else. That’s not a bad thing, and it will certainly benefit lots of buyers – it’s just surprising that the German’s chose to water down the driving experience. Maybe they decided they’d be a bit more sensible for once. And who can really blame them? This is a bulky hatchback aimed at families who don’t want to have to work too hard on the road. You still get the sporty image, but you get it with an easier-to-live-with driving experience. There’s still lots of power on offer from the available engines. A 2.0-litre 148bhp diesel used to sit at the bottom of the range, powering the 418d model. This has since been discontinued, which is a shame because it was a frugal and performative engine. However, we like the 420i and 430i petrol models that are both powered by a 2.0-litre engine which is highly capable. You might want to overlook the former, however, if you feel that 184bhp won’t be enough. The 430i will easily be enough for most, though. It can do 0-62 in just 5.0 seconds, and is smooth and quiet the whole time. If you want something sportier, either the 435d diesel or the 440i petrol model are good bets. The diesel delivers up to 309bhp, while the diesel can produce up to 326bhp. Add a few of the sporty optional extras and this comfortable cruiser really does come out of its shell, turning into something sporty indeed. By the same token, such raucousness doesn’t really suit the overall laid-back personality of the car. As mentioned, this isn’t the most fun car that BMW have ever come up with. It has two more doors than the coupe and weighs more, and this does have a dampening effect on the way it handles. Still, it’s balanced in bends and, if you opt for one of the top-specced models, you’ll benefit from the added grip offered by four-wheel-drive. The dash is, as expected, a classy affair. The car gets the brands intuitive and easy to use iDrive system, and everything is logically arranged. It’s super slick stuff that reeks of maturity and sophistication. BMW have positioned this car as a sports coupe, but the truth is that it’s much more comfortable than that. Indeed, it’s just as comfortable as a 3 Series saloon. 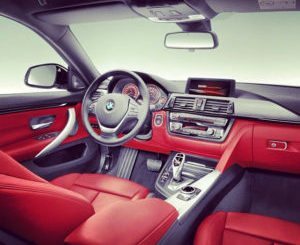 If you’ve already had a look at the 4 Series Coupe and were put off by issues such as the hard-to-access rear seats, you’ll be pleased to know they’re resolved here. The two extra door work wonders for the cars usability, while BMW have added 12mm more height. This means interior headroom is good, although a sloping roof still means it’s not quite as good as it could have been. There is technically room for five people, but BMW would prefer you to see the car as a 4+1. This means that there is a middle seat, but it isn’t advised to let someone sit in it for too long. Not unless you want an angry passenger complaining all the time! The boot, meanwhile, measures 480-litres, which is par for the course in this class. If you fold the rear seats, you can increase that space to 1,300, which is much more than you’ll get in the Audi A5 Sportback. This is considerably more expensive than the rival A5, but standard equipment is better. It includes rear parking sensors, a 6.5” colour screen, heated front leather seats, a digital radio, and front and rear parking sensors. Move up to the SE model and you get sat nav, 17” alloys, parking sensors and air conditioning, while the Sport trim comes with unique interior and exterior detailing and ambient lighting. The Luxury trim, meanwhile, adds a better infotainment system. In terms of the cars safety, BMW’s excellent reputation for safety precedes it, and you can expect the 4 Series GC to follow the 3 Series and 5 Series saloons in being one of the safest cars on the road today. Prices for the new car start out from £30,200 and rise to £45,750. For more information on our leasing deals, check out our page here. In terms of its running costs, how much you pay depends on which engine you buy, as costs vary fairly wildly. The 418d and 420d diesel models are both powered by a frugal 2.0-litre turbo engine that can achieve average fuel economy returns of 65.7mpg. The 3.0-litre turbo diesel will be more appealing to anyone who wants more pace, but only good for fuel economy returns of just under 50mpg at best. The speedy 440i petrol model, meanwhile, can return no better than 42.8mpg, and emits 159g/km of CO2. It won’t set the pulses racing, but there is no denying that this a fresh, handsome car. The load area is good, and the 480-litre boot comes with a useful, big hatchback tail gate. You get more standard kit with this than the A5, and each model is well-equipped. It costs £3,000 more than the saloon, which may leave you with a big decision to make. It’s a fairly big car, but being caught between a coupe and a saloon means rear seat space has been compromised. Indeed, rear seated passengers might get the impression they’re sat in a regular hatchback. 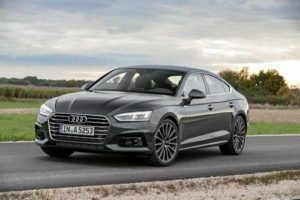 The brand new Audi A5 Sportback is one heck of a sleek-looking hatchback. Since when were hatches supposed to look this good? In many ways, the new A5 Sportback is near enough the perfect package. It’s quick on the road, athletic and agile. But perhaps best of all, it’s also really quiet. The only downside to the driving experience is the artificial steering. That aside, the A5 is a joy to drive, either in the city, on the motorway, or down twisting country roads. It’s smooth and comfortable, and just as engaging as the BMW. In terms of the engines, the 2.0-litre 187bhp diesel engine has proven to be the most popular so far. It’s economical, has good pulling power, and picks up pace well. It can do 0-62 in less than 8.0 seconds, which should satisfy most buyers sniffing around this class. A 2.0-litre petrol engine that develops 249bhp has already been used in a few Audi’s to date. It’s much-loved by petrol-heads, but being more expensive than the aforementioned diesel, it might not get too many takers here. A 3.0-litre 349bhp petrol engine that powers the S5 is more expensive than the 2.0-litre petrol, but it might tempt you away from the diesel by the amount of performance it has on offer. 0-62 in 4.7 seconds might leave you foaming. But does it really suit a car like this? Moreover, the popular 2.0-litre 187bhp diesel can average returns of 70.6mpg, which are very family-friendly numbers. Better still, it emits only 109g/km of CO2. The 2.0-litre 249bhp is good for fuel economy returns of 47.8mpg, and costs £130 a year to tax. Step inside the car and you’ll be greeted by a very pleasant, very attractive interior. Engine noise is well suppressed, ride quality is good, and the materials are of a high-quality. It’s largely faultless, with our only criticism being that the infotainment is in a bit of an awkward “look at me” position on top of the dash. The dashboard, meanwhile, is slick and minimal. This is also a really practical car. The sloping roofline does compromise rear head space, but apart from that the car is usable. Front passengers have plenty or room, there are a pair of ISOFIX child-seat mounting points in the rear, and the boot measures 480-litres. The new Jaguar XF is a bit of a head-turner. It will dazzle crowds with its looks, and the wow factor extends to how useful it is. It’s entertaining to drive, but don’t expect too much by the way of punchy acceleration, as its engines have been designed to be as smooth and economical as possible. However, since BMW haven’t endowed their 4 Series GC with as much driving prowess as usual, the XF can claim to be one of the most engaging cars in this class. The most popular engine with buyers is a 2.0-litre diesel that’s available in either 161, 178 or 247bhp guise. We like the 178bhp variant the best; it’s a classy all-rounder that can do 0-62 in 7.7 seconds, and comes wedded with a slick-shifting automatic transmission. With that said, even the entry-level 161bhp diesel will be sufficient for most of you with its 0-62 sprint time of 8.2 seconds. You can pair it up with either an automatic or manual gearbox and expect the same performance. There are also a pair of genuinely quick 2.0-litre petrol engines available, but easily the biggest draw is the 3.0-litre 375bhp V6 petrol engine that’s come from the F-Type. It’s got plenty of pedigree, and can do 0-62 in 5.1 seconds. However, an engine like that is a pure luxury engine, and we reckon most buyers will be happy to settle for the 2.0-litre 161bhp diesel and its 70mpg and 104g/km of CO2. Jaguar have always set themselves high standards where interior design and comfort is concerned, and here they have met those standards once again. There is plenty of techy stuff in here to keep things fresh and interesting, such as the rotating air vents and the rotary gear selector knob that rises up. Innovative and dead handy. However, the brand’s 8” infotainment system (which can be upgraded to a 10.2” screen) can’t match BMW’s iDrive system. Still, the upgraded version gets lots of customisable features, and it comes with smartphone connectivity. 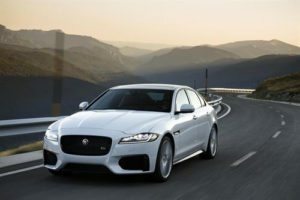 The 2017 Jaguar XF is a practical car. The big boot measures 540-litres, and comes with rear-folding seats as standard. We also like the gesture control system that lets you wave your foot beneath the rear bumper for easy access to the boot. Jaguar reckon rear-seat space is now best in class, and with 24mm extra knee room, 27mm extra headroom and 15mm extra legroom over the outgoing model, it’s hard to dispute their claim. It’s roomy and comfortable. That this car exists is something of a miracle. BMW has certainly taken the long road to creating this car, slicing the roof off the 4 Series coupe to create a convertible, before coming up with this to rival the Audi A5 Sportback. It’s a sleek, 4-door coupe-saloon that blends style and practicality, and economy and performance to good effect. But is it really a car that you need or is it one that BMW are trying to convince you that you need? We think the former, but to find out you’ll have to give the new BMW 4 Series Gran Coupe a test drive.